The Pendleton Classico-W Sofa with Lounge Chairs and Fire Table Set showcases top of the line comfort and unmatched durability. The set invites up to five to take a seat on comfortable plush cushions and enjoy an evening of conversation by the fire. OW Lee has combined the intricate patterns of Pendleton fabrics with performance of Sunbrella outdoor fabrics to create a timeless style that will impress the most discerning customers.The star of this set is the Pendleton Santorini 36" x 58" Occasional Height Fire. Featuring a hammered rim, durable iron, and reliable heat, this fire table is the perfect addition to any yard. This set also includes a pair of side table for refreshments and a pair of decorative pillow. This set is made in the United States and includes free shipping. 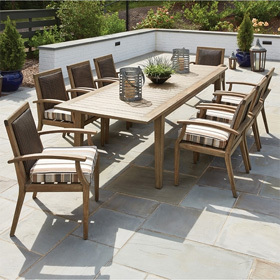 Lifestyle Photo:Shown in sable finish with Diamond River Fawn and Ombre Stripe Sandstone Fabrics. Atlantic City table top tile. Sofa 76.25"W x 34"D x 35.5"H 130 lbs. Swivel Rocker 28"W x 31"D x 37"H 68 lbs. Spring Base 28.25"W x 32.25"D x 37"H 69 lbs. Fire Table 58"W x 36"D x 19"H 200 lbs. Side Table 24W x 24"D x 21.5"H 200 lbs. Pillow 19"W x 8"D x 19"H N/A lbs.